To a Buddhist monk in his geango training (meditation training to seclude oneself in one place for ninety days in summer ) in a mountain village in Yase, Kyoto, a woman visits every day to leave nuts, fruits, and firewood. When the monk asks her name after some dialogue, she implies that she is a ghost of Ono-no-Komachi, who once enjoyed a reputation for her beauty and talent. Then, she disappears. When the monk journeys to Ichiharano and holds a memorial service for her, the phantom of Ono-no-Komachi appears and asks the monk to administer the precepts of Buddhism. However, a shadow of a man approaches Komachi from behind. It is the vengeful spirit of Fukakusa-no-Shōshō (General Fukakusa), who fell in love with her. General Fukakusa trapped by his love for her tries to prevent her from receiving the precepts. The monk asks the two ghosts to show him the circumstances in which General Fukakusa visited Komachi for one hundred consecutive nights. Komachi, who Fukakusa proposed to, set for him the unreasonable demand of visiting her every night for one hundred nights and staying through the night in a platform for tying up ox-drawn carriages. He dutifully came on foot to visit her every night, regardless of whether it was a dark, moonless night or whether it was raining or snowing. The ghost of General Fukakusa reenacts the scene. Finally on the hundredth night, when they are about to exchange cups of sake as a pledge, he realizes in a mere instant that drinking breaks a Buddhism precept. In the end, the two phantoms receive the providence of Buddha and are saved. In “Sarugaku Dangi” which includes the stories of art by Zeami, “Shii-no-Shōshō (General of the Fourth Rank),” which became the base of “Kayoi-Komachi”, is introduced as a piece written by Kannami. “General of the Fourth Rank” means General Fukakusa. 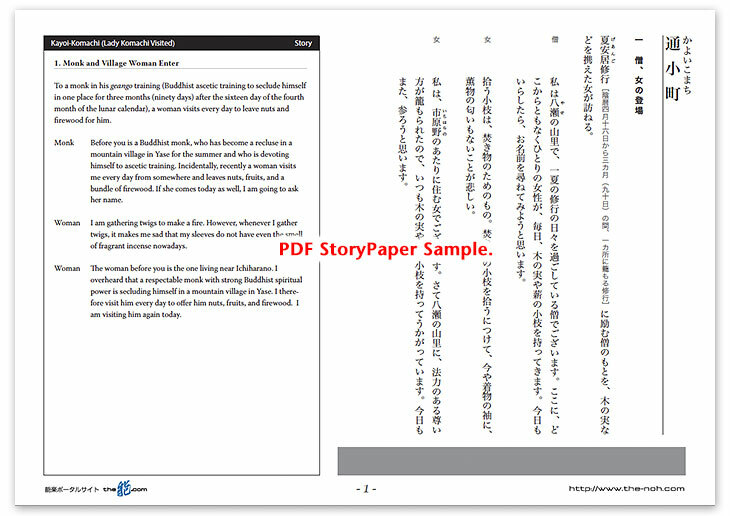 The book also reports that Kannami revised a piece which was composed by a Buddhist monk in Yamato Province and performed by Komparu Gonnokami. This is one of the oldest existing Noh dramas. This short piece describes attachment in the dialogue between Ono-no-Komachi and General Fukakusa. Nochiba or the last half of the drama where the characters reenact the scene of the one-hundred-night visitation is full of dynamic forms and movements and truly worth watching. 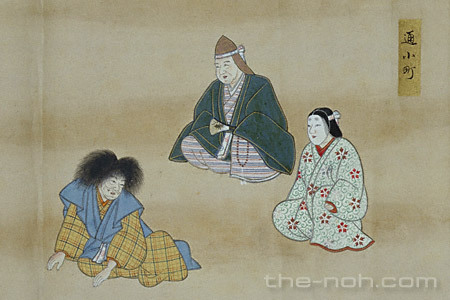 Although the original story of the one-hundred-night visitation describes the fate of a man who cannot complete his mission on the very last night, this Noh piece changes the ending so that he receives the providence of Buddha. The piece describing a man’s obsessive love is truly gloomy. However, the leading character of this drama, General Fukakusa, has an aristocratic well-bred character, a graceful sincerity. This creates an aura beyond gloominess, and all the more reason to lead audience to the world of pity and sensitivity.